Janusz Kozinski is proud and excited. 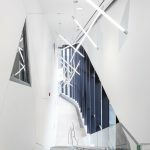 The new, hands-on dean of York University’s Lassonde School of Engineering oversees a tripartite campus-within-a-campus, comprising the Lassonde computer engineering building, the Petrie earth and space science and engineering building, and the Bergeron Centre for mechanical, civil and electrical engineering, all clustered together at the southwestern edge of the university’s property line in north Toronto. 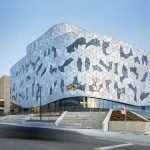 Built with BIM technology to a mathematically precise algorithm, the building is a five-storey-high “cloud” of triangulated glass floating above a curvaceous concrete “rock” islanded on a sloping landscape. The façade’s myriad facets permit light to flow inside during the day, blaze outside at night; its unique undulating exterior blends in with the sky, refracted reflections making it seem in a constant state of flux. Nearly half the school’s curriculum is online and can be accessed from anywhere. 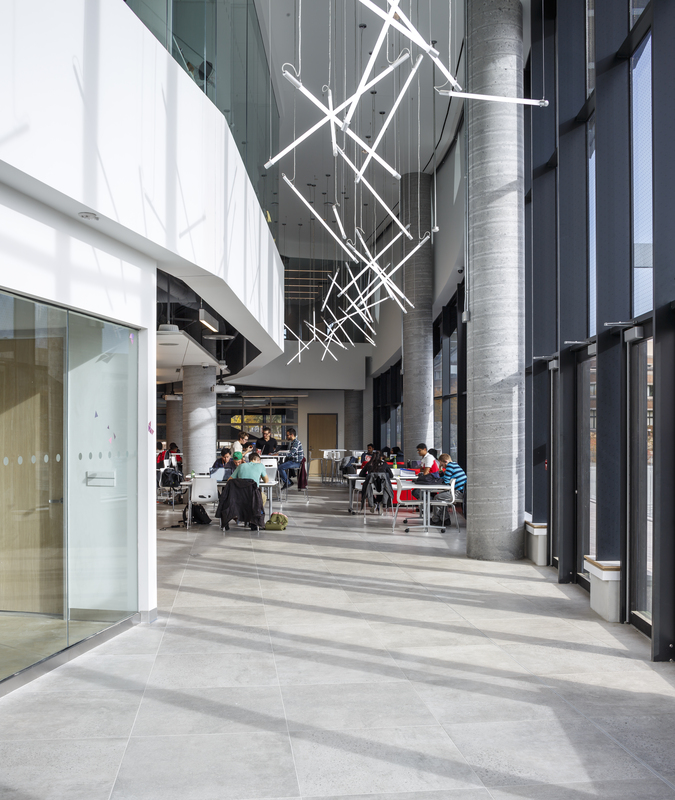 Students on campus are therefore encouraged by example and by design to spend their time with or without their professors, clustered in small groups, solving problems. 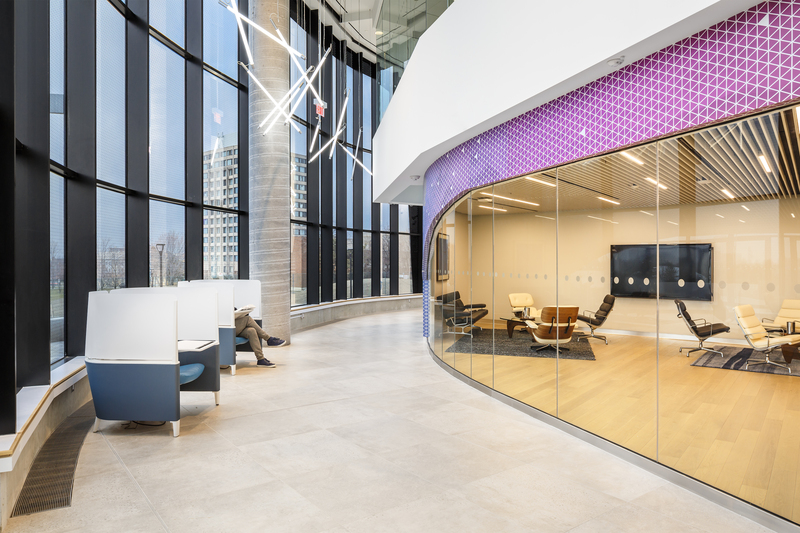 To accommodate this fluid learning process, Mamiche created flexible, omni-purpose spaces with plenty of computer plug-ins and whiteboards. 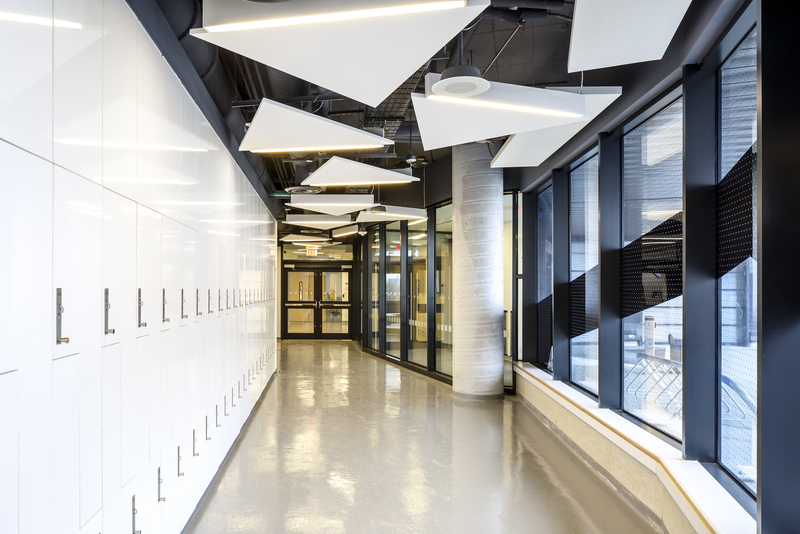 Many of the walls, including those along the circulation areas as well as the banks of lockers, are finished in writable paint, ideal for spur-of-the-moment scribbling. Oddly enough, Mamiche adds, the availability of so much writing space has greatly reduced the amount of graffiti the university usually sees. 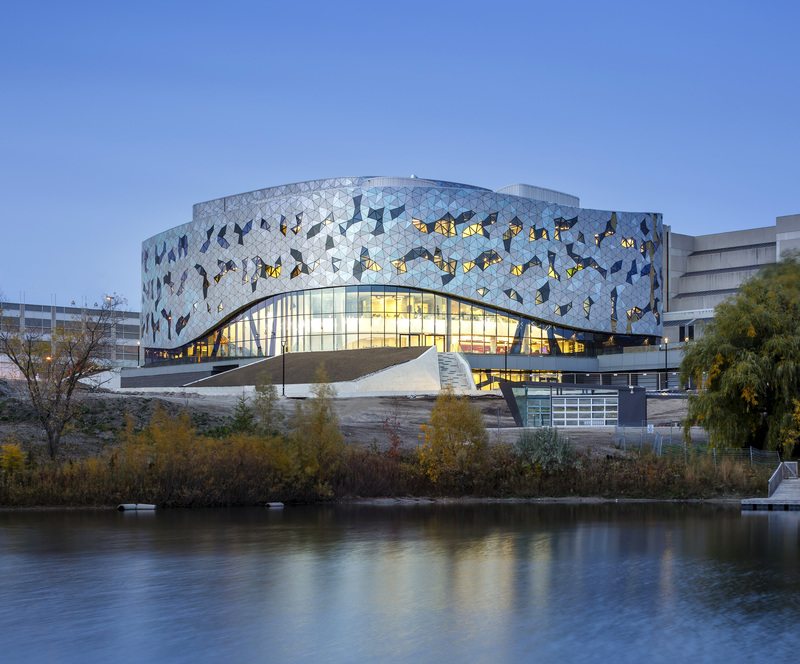 On nice days, classes and socializing can move easily out of doors, with students sitting along the Bergeron Centre’s terraced edges, or down on the grassy sward that overlooks a nearby conservation area, with Toronto’s jagged skyline spiking up through the horizon. 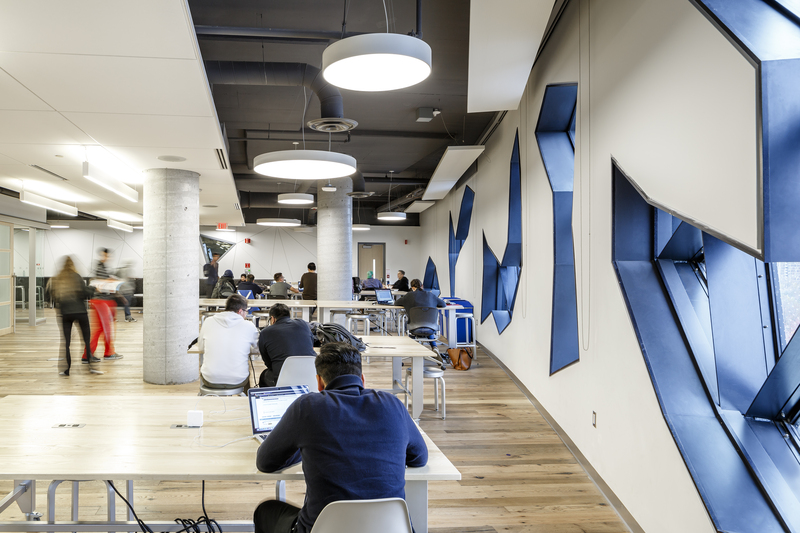 The relaxed, collaborative indoor atmosphere – dotted with ad hoc workspaces, a café, student-run clubs, and a design commons called the Sandbox – most closely resembles a modern, tech-oriented office place. 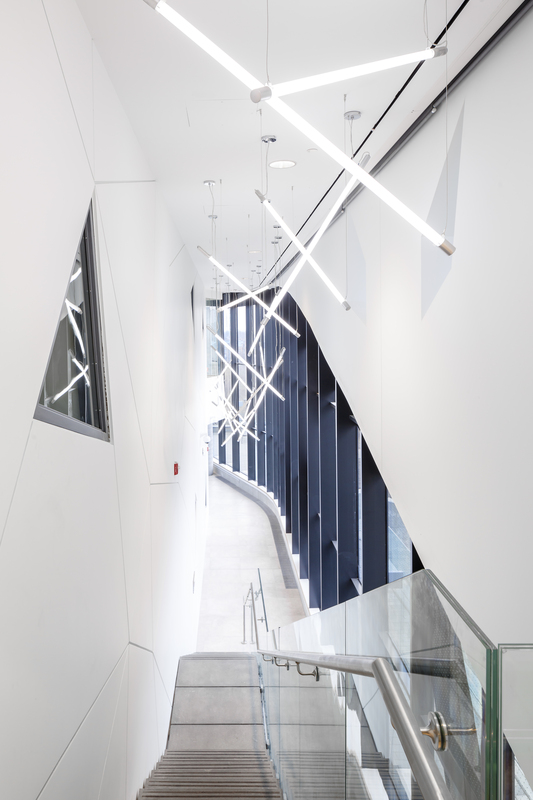 The floor’s vinyl and porcelain tiles mimic cool concrete; overhead, twisting mechanicals and tumbled fluorescent-tube lights predominate, punctuated by the occasional triangular slab that merely sketches in the idea of a dropped ceiling. The triangular motif crops up again and again throughout the interior, even showing up in upholstery fabric and window mini-decals. To Mamiche and Catsaros, the triangle represents the purest, most pleasing geometric form. 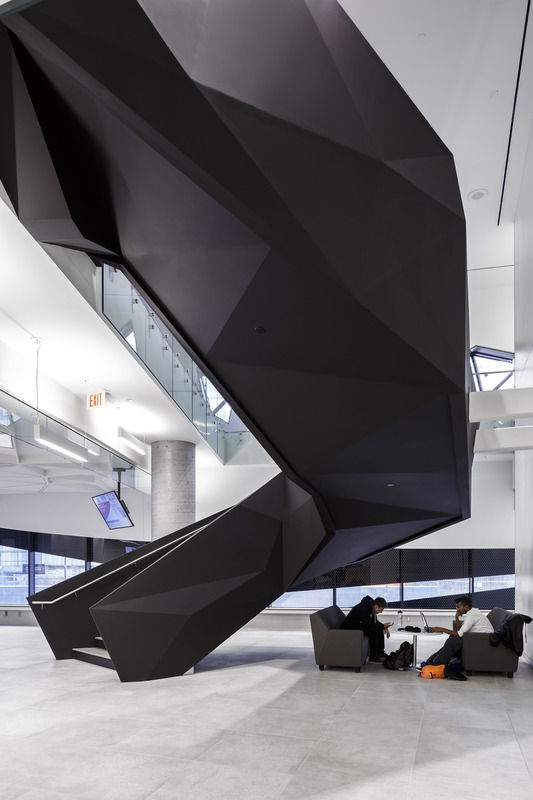 To Dean Kozinski, it relates to the three engineering pillars of the Lassonde School. 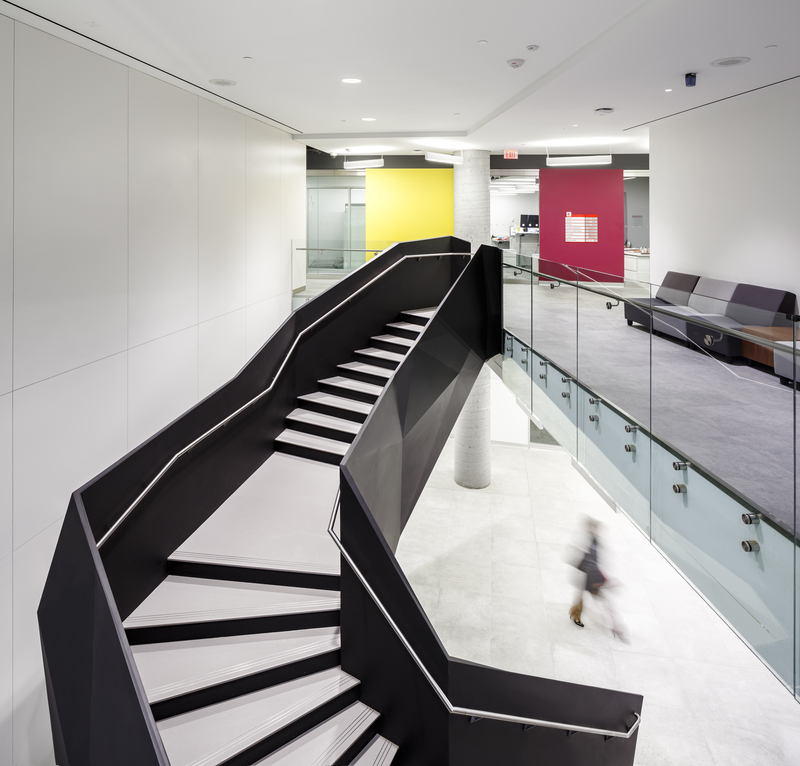 The correlation between the Bergeron Centre’s interior and a real work environment is deliberate, bound to Kozinski’s third design criteria of the Renaissance Engineer. As he describes it, the school must prepare students for life outside of academia. “Most will be self-employed and need to understand legalities, ethics, and the business of engineering, as well as how a variety of disciplines can interact with and impact their chosen speciality,” he says. 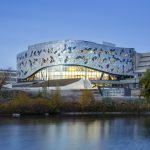 The Lassonde School of Engineering has therefore partnered with York’s Schulich School of Business and Osgoode Hall Law School to help create a more rounded next-gen graduate, one who uses creativity, entrepreneurial skills and social awareness to solve 21st century challenges. 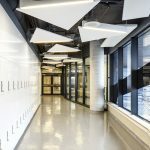 As for the challenge of building the Bergeron Centre, ZAS has already given the school’s students an enduring illustration of mathematical and multidisciplinary excellence. Needless to say, Dean Kozinski couldn’t be prouder. 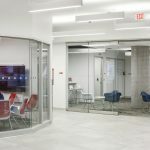 The Bergeron Centre boasts an enviable selection of hands-on labs. 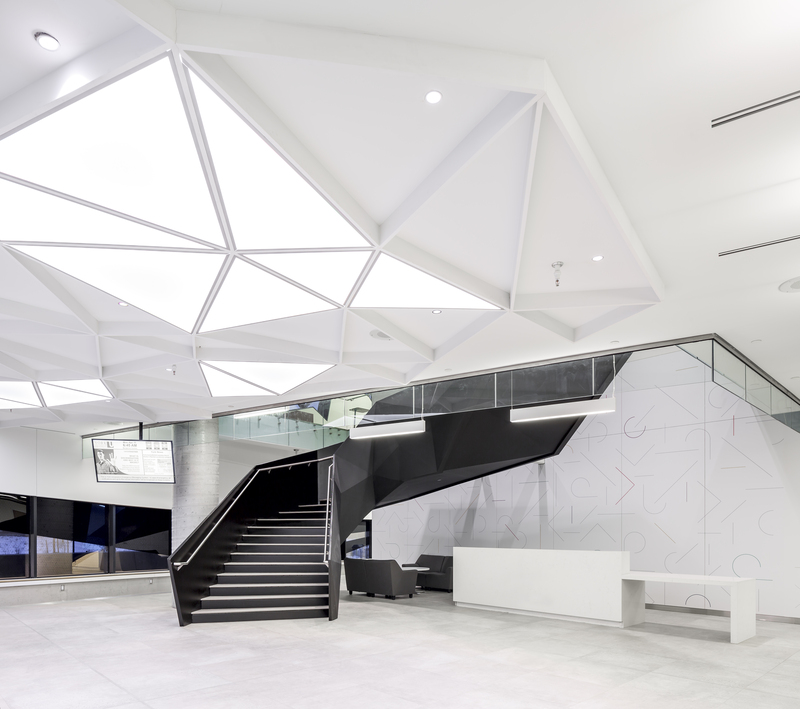 But, hands down, the most impressive is its Highbay Materials Lab. This multi-storey structure was built as a “building within a building,” insulated from noise, dust and vibration, with a one-meter-thick concrete floor and meter-and-a-half concrete reaction walls, the latter perforated to hold steel anchor rods. Why all this engineering overkill? 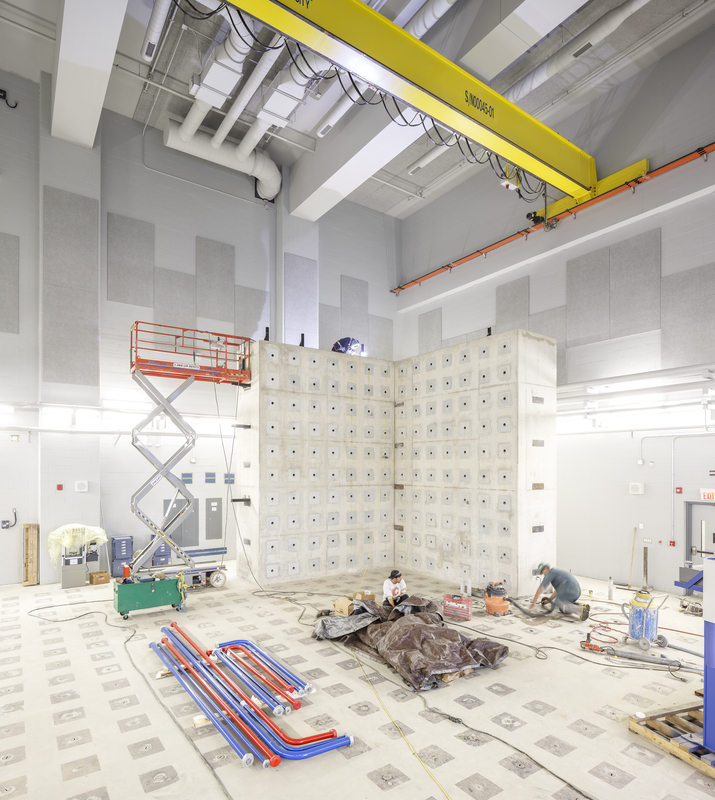 So students can perform stress tests on large structural materials in the kind of space previously available only to engineers in the field. Or, if they don’t want to get their hands dirty, they can always view the proceedings from the lab’s elevated steel-and-concrete walkway.